I've been a fan of the Kirstie's Homemade Home craft TV series (you can watch the old episodes through the 4oD player) since watching the first episode back in April 2009. The first two series covered quite an array of crafts and though they only touched briefly on each of them they did give you a taster and got a huge number of people in the UK crafting. This new series is a little different (you can also watch Kirstie's Handmade Britain on 4oD) , instead of Kirstie just having a quick go at a few crafts each episode she is instead trying to enter what she makes in the various craft competitions being held in Farm shows across the UK. This does mean that Kirstie has to actually make the things she is entering (in the earlier series it was always a case of her doing an hour and then leaving her craft creations to be finished off for her) but I'm not too sure why the focus is on doing craft at a competitive level. The latest episode was about papercrafting and I found it quite disappointing. 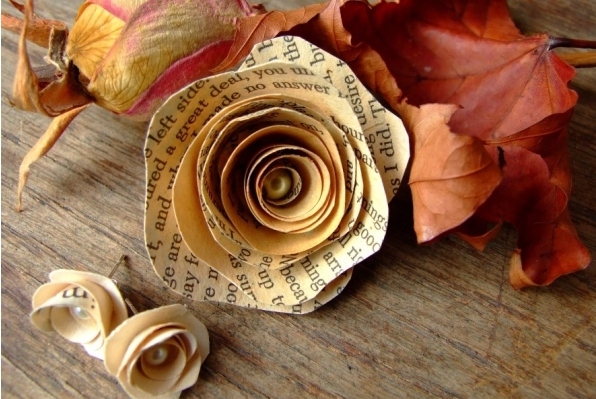 The items Kirstie made though interesting were not particularly taxing (I do love these paper roses though). The episode also focused on the other papercrafts entered and these were disappointingly old fashioned - the embriodered cards were especially so. So instead of being fired up to give entering what I make at a local fair I'm not even tempted to try. I've been quite enjoying it, even though I can already make scones and fruit cake and am unlikely to ever do any machine embroidery. I guess without the competition element it would have basically been like the last series, but I agree on all the embroidered cards and old ladies! I bet they were all secretly muttering 'Fix!' under their breath this evening! I hope you are enjoying yourself! I noticed kirsties book in Hobbycraft just now £15.00. Its a great series. I did like the one before though. And there I was enjoying it! I love having something crafty to watch when I crochet, it's my little nap-time treat. The projects are lovely for novices like Kirstie and I do enjoy the shock when she sees how basic hers are. I am enjoying it too - honest! Just a little confused as to why the whole competition aspect is part of it.